Fills spaces well and looks great. Good price for the size and quality. Very easy to use. Fill it and turn it on! Summary: For the price and quality, the Tenswall aromatherapy essential oil diffuser is a great purchase. It will fill a large room without troubles and looks great as a design piece. It is a unique design​ that looks great by itself as a design piece. The LEDs are always a nice touch for me as I like a bit of flair. In a dark room, the LEDs are calming and neat to watch. I was pleasantly surprised to find out how quiet it was. At ​35 dB, it's basically whisper quiet. This makes it a great aromatherapy essential oil diffuser for your bedroom or for a kid's room. ​As with most diffusers, the user interface consists of a few buttons. To set all of the options you want, it typically takes a few combinations to get your settings how you'd like. Thankfully, the Tenswall diffuser has clearly labeled buttons. The price point​, quality of looks, and functionality make the Tenswall ultrasonic diffuser a great purchase. 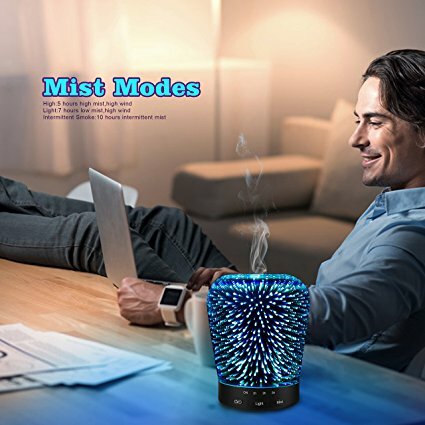 I would highly recommend if you are looking for this type of aromatherapy diffuser to purchase the Tenswall Wood Grain. Q. What are the best essential oils to use? You're in luck! We've covered this in depth in our article about the best essential oils.​ If you want to try a large mix, you can buy a variety kit of 18 essential oils, check the price on Amazon. A. With the size and power of the Tenswall Ultrasonic diffuser, you can put it in just about any room you want. It will provide very strong coverage for a small room, and can easily fill up a bedroom or living room. It is great for many room types, all depending on the coverage you're looking for. Q: Why won't my ultrasonic diffuser start? A. Make sure your power cord is firmly attached. If so, make sure you understand your timer settings, you might be setting it for a short amount of time. Disclosure: HelpfulSleep.com was provided this product free of charge in exchange for a fair review of the product. We strive for transparency and also strive for providing quality and honest reviews. All opinions of this product reflect our real thoughts regarding this InnoGear diffuser. One of the easiest diffusers to operate. Summary: This essential oil diffuser is a great product, especially for the price. If you're looking for one that looks great in any room and doesn't require much maintenance, buy one today! 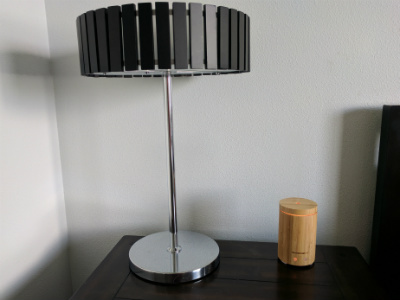 Right out of the box, I loved the look of the InnoGear Real Bamboo essential oil diffuser, it looks just like it does in the pictures.​ Here's what it looks like on my dark wood nightstand. It is a nice accent piece for a bedroom, kitchen, living room, anywhere! It is also small enough to fit between other items such as a lamp or some pictures. Here are some more pictures of it on my nightstand compared to a lamp, as well as a water bottle. As you can see, it is quite compact and able to fit in many tight spots. The diffuser came with a small instruction manual, which succinctly sums up all you need to know - no need for a whole book of instructions.​ To fill up your essential oil diffuser correctly, just add water at or below the MAX line (I just use tap water right from the sink), and press the left button to turn it on! The button on the right allows you to control the LED color, 7 in total. The first press will automatically cycle between the colors, the second press will stay on the current color, and a third press of the button will turn the LED off. Below is a quick video showing the InnoGear Real Bamboo essential oil diffuser running through the LED cycle mode. This video also displays how quiet the diffuser runs. Great for use right next to your bed to help you get a nice, relaxing sleep! You can use any water soluble essential oil. As for what recipes you should use, that is up to you! It is always fun to experiment to find what your favorites are. Click here to purchase a highly rated set great for starters. 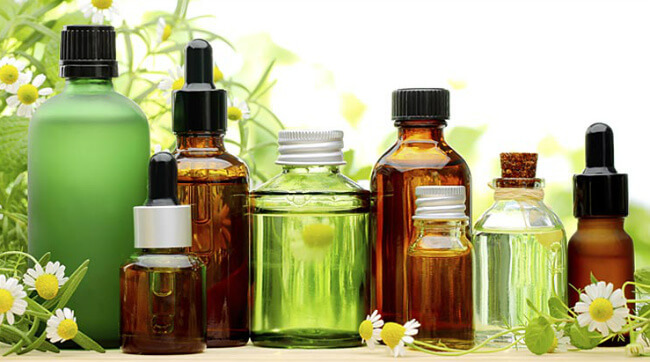 Head on over to our best essential oils article to see our picks! ​While you're clicking around, feel free to see what are some of our other favorite diffusers. 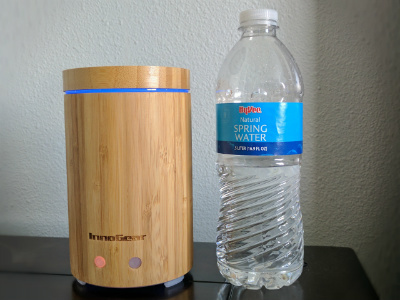 You can find the price for the Real Bamboo diffuser on Amazon.com and see if there are any current discounts.​ For the current price, it is a great diffuser for small to medium rooms, and really great for bedrooms and bathrooms. It is one of the best selling essential oil diffusers on Amazon right now with a great rating, so I highly recommend you pick one up today! Maintaining and moving this unit is very easy with the limited moving parts and the compact size. As a nice bonus, InnoGear strives to make their customers happy as they offer a 12 month guarantee on the product from the date of purchase. If you want a replacement or a refund, you can contact them at support@innogear.net or (800) 806-3008. It was very nice of InnoGear to send us over one of their highly rated diffusers to give it a good test​ and share our opinions with our readers. 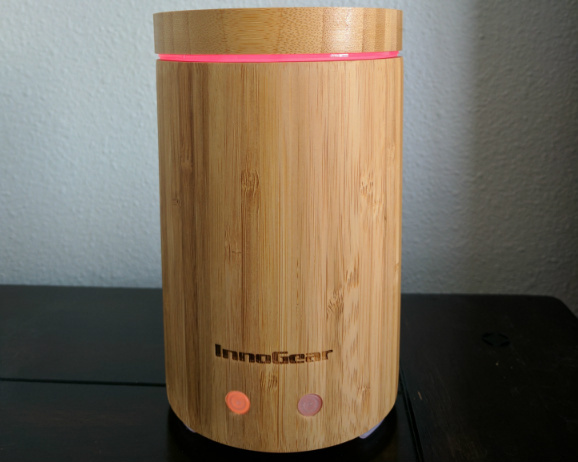 Let me know in the comments if you agree with my thoughts on the InnoGear Real Bamboo essential oil diffuser review. I overlooked it in my initial diffuser reviews, and I would highly recommend you purchase one! Stress is the most common factor that prevents people from falling asleep and getting adequate rest. Aromatherapy is a great way to turn your brain away from negative and stressful thoughts. With the help of the best aromatherapy diffusers, your room will be filled with calming scents from beneficial essential oils. Keep reading to see my picks for the best essential oil diffuser. Using essential oils to help you sleep is one of those ancient remedies that is making a comeback. An easy and effective way to soothe your brain and put your mind into a sleepy place is to use aromatherapy. There are many essential oils that are proven to help calm your thoughts and get your mind ready to send you off to sleep. I hope this review of the best essential oils for sleep will open your eyes (and then get them to close) to the many ways that essential oils can benefit your sleep.